Thomas & Friends (previously known as Thomas the Tank Engine & Friends) is a children's television series about the engines and other characters working on the railways of the Island of Sodor, and is based on The Railway Series books written by the Rev. W. Awdry. This article lists and details episodes from the eighth series of the show, which was first broadcast in 2004. This series was narrated by Michael Angelis for the U.K. audiences, while Michael Brandon narrated the episodes for the U.S. audiences. 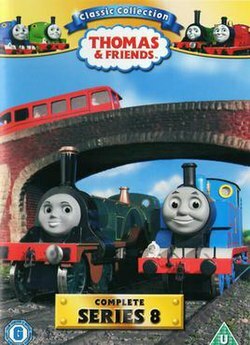 Starting with this series, Thomas & Friends broadcast in the United States for the first time as a whole television program. It had first appeared as sequences from the American television show Shining Time Station from 1989 to 1995. For the eighth series, Steve Asquith, after 20 years as a crew member, took over as director from David Mitton, who had directed the show since its first series, and Simon Spencer became the producer. In addition, Robert Hartshorne and Ed Welch and Peter Lurye took over as composers and songwriters after Mike O'Donnell and Junior Campbell departed. Paul Larson and Abi Grant were the script editors for this series. This was the first series to introduce a new opening  and closing credits, plus a brief description of the Island of Sodor before each episode began. Also starting with this series, the length of the episodes were increased to seven minutes from the original four-and-a-half minutes. The series was produced using digital video cameras, which created a somewhat different look for the show. There was also a subtle shift towards the use of CGI elements, provided by HiT Entertainment's subsidiary HOT Animation, although filming remained at Shepperton Studios. For the U.S. broadcasts, other changes include the additions of CGI sequences in mini-segments between episodes, transition effects, and a book opening intro section. This series was also the first series that saw the use of The Steam Team, the centralised cast of eight characters including Thomas the Tank Engine, Edward, Henry, Gordon, James, Percy, Toby and Emily. This is an episode format that includes 2 episodes of Season 8 and a short episode from Season 7 in the middle of the airing. In addition, it also includes educational segments and additional songs. It's Lady Hatt's birthday and the Brass band is coming to play at the party. Thomas is taking the brass band with Annie and Clarabel but he leaves the tuba player behind. As Thomas goes across the Island, the tuba player finds ways to catch up to him. Percy brags to Arry and Bert that his whistle is louder than their horns, but his loud whistle causes trouble for the others, and eventually himself when a giant snowball hits him. Percy then relises that his whistle is for emergencies only. While working at the Ffarquhar Quarry with Mavis, Diesel starts a rumour to Thomas that the Fat Controller plans to scrap the steam engines. The next day, however, the diesels get faulty oil and fall ill, leaving Thomas to bring them new oil from the depot. Henry wishes upon a sacred tree to pull the Express like Gordon does, but he learns to be careful what he wishes for when he sees how hard it is to pull it well. James is very proud of his splendid red coat, and he spends his time looking at his reflection in the canal. However, to make up for lost time, he takes on Percy's job of taking the Troublesome Trucks of coal to Brendem Docks, which soon ruins his coat. Thomas is excited for the opening of a new station, but must find a way through the difficult bend on the track, and it gets harder when Annie and Clarabel have to be sent away for repairs. Percy jumps to conclusions when he overhears the Fat Controller saying that Percy is going to the Scrapyard tomorrow, and thinks he is getting scrapped. On the day he tells Cranky the Crane to hurry up and doesn't make any deliveries correctly, including taking the tar wagons to mend the road and crashing them into Gordon. Thomas ignores Emily's warning about snow, and her instruction to use his snowplough. But he learns the hard way to listen to her advice. The engines decide to show their appreciation to Thomas by throwing a surprise party. But they are having a hard time keeping the secret from him. Emily is desperate to keep her flour route after hearing that the Black Loch run has a monster in the lake, however, the Troublesome Trucks give her a hard time with her deliveries. Thomas and James fight over who should pull the vans of fireworks to a party. But they both soon learn that they must work together when James breaks down at a red signal and soon learn the display might be cancelled when Gordon is taking the children home. Gordon acts boastful around Percy as he shows the little green engine the way to pull passengers, but forgets the dangers of the icy track as he does so. A railway inspector is coming, and Gordon, James and Emily are determined to win the Cleanest Engine Award. Thomas and Percy find this difficult to do, only for them to win when the three big engines get covered with coal at the Coaling Plant. Spencer returns to take the Duke and Duchess to their holiday home, while Edward pulls a flatbed of their furniture. They have a race, but Edward is very old and sometimes slow. Gordon worries that he will be scrapped due to the squeaking and rattling he makes. He tries to hide this from the Fat Controller, but has to take him on a run. Thomas doesn't listen to Percy and James's offers for help with the circus deliveries. But he later pays the price when he breaks down and gets stranded by a field with the performers. Thomas is cross about having to go slowly with his load of eggs. He decides to go fast after all, but pays the price when some eggs get broken as he does. Emily wants to prove that she can be as fast as Gordon. She tries to do as much work as he can, but it is too much for her and she runs out of water. This is the 200th episode of the series. Thomas wants to finish delivering the smelly fish as soon as possible, so he takes on too many of the Troublesome Trucks at once. He has to put up with the fish longer now. Emily has to make her way past the storm damage obstacles to deliver wood for Farmer McColl. Crossly, she bosses her friends about to speed things up, which does not work. Thomas and Emily are not scared to go to the Smelters Yard on Halloween. However, 'Arry and Bert want to have some fun and decide to spook the steam engines, but accidentally spook themselves. Gordon ridicules Toby for being only a steam tram, so Toby mopes about not being a proper engine. But Gordon gets stuck on the hill, and Toby is his only hope. James takes too much pride in delivering an important load of coal, and ignores the others who need help. Salty has a word with him, and teaches him kindness. Thomas takes on three jobs that take their toll and tire him out. He refuses help from Emily and winds up mixing up all of his jobs. Thomas is disappointed to be taking ice cream ingredients rather than children. He gets into scrapes on the way, but does not realise this job is important, too. Salty tells Percy that the red carpet he is delivering is magical. The others refuse to believe this, but Percy thinks it is magic that is making it float up. ^ a b This episode was first released on the All Aboard with the Steam Team VHS/DVD on 24 May 2004. ^ a b c d This episode was first released on the Steamies vs. Diesels and Other Thomas Adventures VHS/DVD on 18 May 2004. ^ Thomas and Friends - Intro Season 8-10 (YouTube video). TTTEANDFRIENDS. July 11, 2011. Retrieved November 4, 2017. ^ Thomas and Friends - The Island of Sodor (YouTube video). 7omaZb3rk. Feb 26, 2017. Retrieved November 4, 2017.